Powered by our national multi-payer claims database, DentaBase®, P&R Dental Strategies network intelligence and optimization solutions are available as either a Software-as-a-Serivce (SaaS) web-based tool or a turnkey, subscription-based network accuracy service. 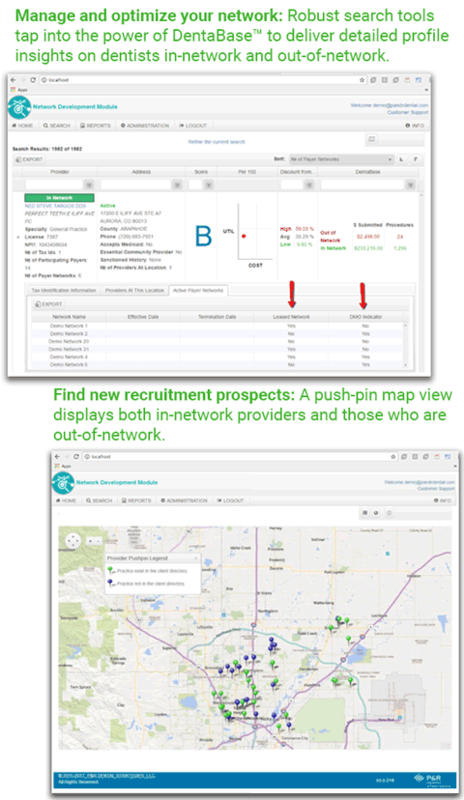 Increase the range of potential recruits and network prospects. Help manage a network with preferred capabilities and discounts. Segment a dentist population by financial risk. Gain insights on individual dentist fees to help maximize network contracting and recruiting. For an entirely turnkey, subscription-based solution to managing network accuracy you may be interested in the Network Directory Accuracy Service. Every network management department will benefit from P&R Dental Strategies’ Network Directory Accuracy Service. This service maintains and documents directory accuracy by utilizing our exclusive provider outreach infrastructure and proprietary multi-payer database, DentaBase®. A high-performing network is within reach with network intelligence and optimization solutions from P&R Dental Strategies. For more information complete the form below.